As promised, this is the second installment of my delicious visit to Savannah. Enjoy Savannah, a foodie wonderland. If you read my previous article you know that my visit to Savannah was my first. There were so many wonderful aspects of the city that I loved but none more than the food that I experienced. I still claim that Savannah is a foodie wonderland. Cha Bella is a wonderful little farm to table restaurant. They proudly source nearly all their ingredients from Georgia. Chef Michael and his wife, Chef Candice, are culinary geniuses and the warmest, generous hosts. I was treated to the most wonderful meal, especially created for me. Seriously, Chef Candice came in on her day off to make sure that I received the best Cha Bella has to offer. 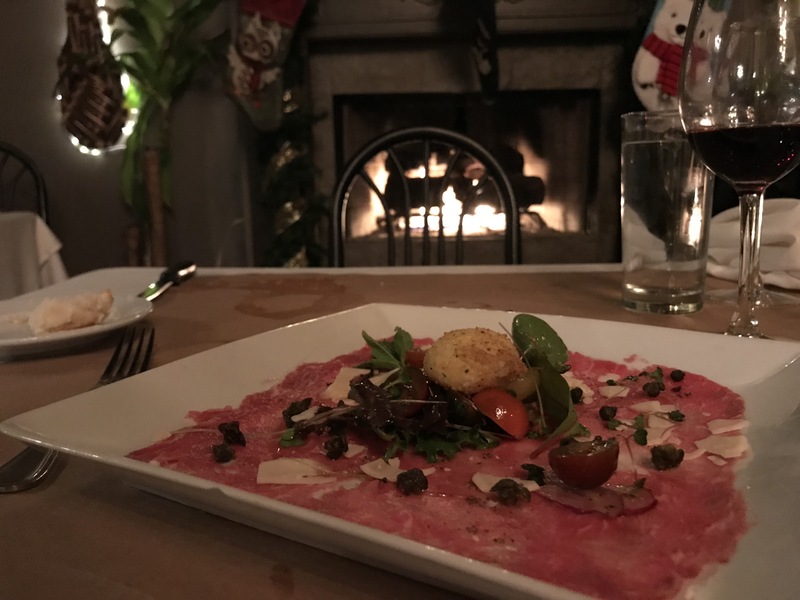 My experience started with an amazing Bison Carpaccio with Cilantro chimichurri, blue cheese-filled Portobello mushroom caps and shaved Parmesan cheese. The ingredients beautifully complimented each other. Next came one of the best shrimp dishes I had in Savannah – Georgia White Shrimp and Risotto. The risotto was perfectly cooked and accompanied by Parmesan, cherry tomatoes, garden beans and topped with a Chardonnay-tarragon pan sauce. It was TO DIE FOR! 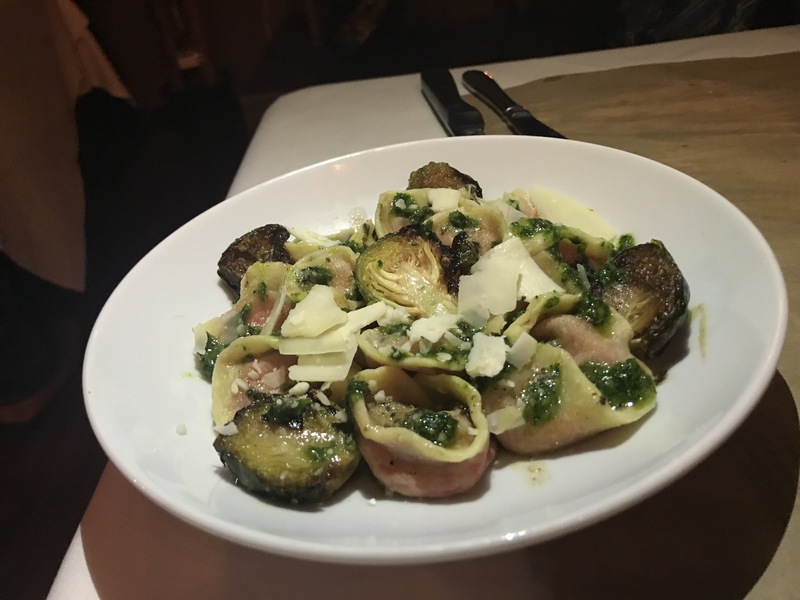 Chef Candice kept the culinary delights coming with a beautiful vegetarian dish of hand made cheese tortellini with Brussels sprouts. This, I was told, she created just for my visit! I was honored and completely gob smacked at the mouthwatering goodness. Just when I thought I couldn’t possibly fit another bite in my stomach, my server presented dessert. Beautifully plated was a small cheesecake, a beautiful chocolate mousse, and candied bacon…yes, candied bacon! I know what you’re thinking..”Really, does candied bacon go with chocolate mousse and cheesecake?”…the answer is ABSOLUTELY!! I can’t describe the happy dance my taste buds where doing. Chef Michael took me on a wonderful little tour of his restaurant. I was most impressed with how each part of it is made from reclaimed, local products. Doing most of the work himself, he has discovered some unique aspects and items left behind from the building. There’s an amazing outdoor space for events like small weddings and meeting. There’s even a swing! I was so impressed with the space and with the restaurant as a whole. If you aren’t a foodie when you enter Ch Bella you will be one when you leave. This restaurant is a wonderland for foodies and non-foodies alike. I would recommend Cha Bella to anyone. It’s not to be missed when visiting Savannah. Cleverly located in a old filling station, Atlantic Savannah is a neighborhood eatery that serves unique dishes, amazing wines cocktails. The atmosphere is friendly and energetic. I loved the outside fire pit and seating area. Inside was just as unique and lively. I love when you walk into a place and there is a buzz of excitement and friendly energy. The staff was simply amazing and I immediately knew I was in for a treat! 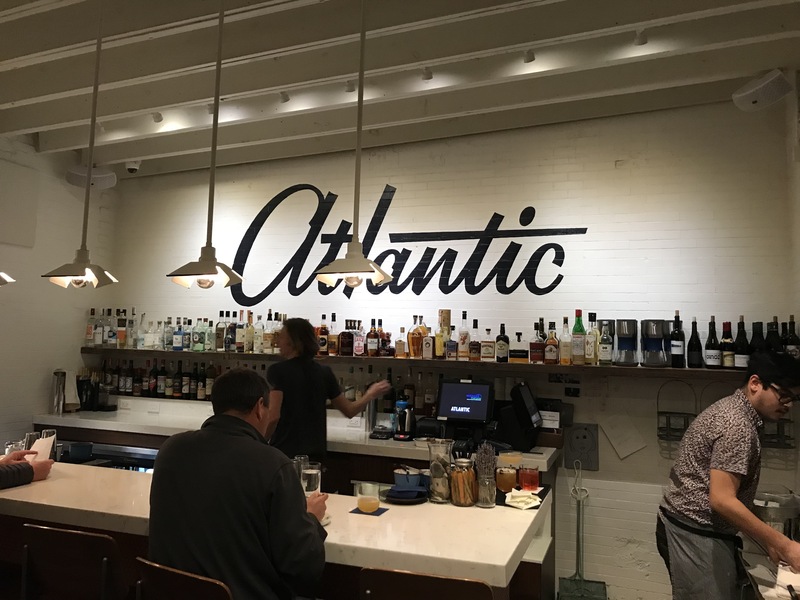 I’m a wine lover and Atlantic has an extensive and fantastic wine list with some amazing wines I didn’t expect. Italian wine is my favorite and I was thrilled to find an amazing option on the drink menu. While I was enjoying my drink the owner dropped by to welcome me and we talked a bit about the restaurant and his inspiration behind it. His passion for it was palpable and evident in the details of the space. Along with his wife and his adorable daughter that was clearly at home visiting with everyone, the staff has an obvious love for what they do. 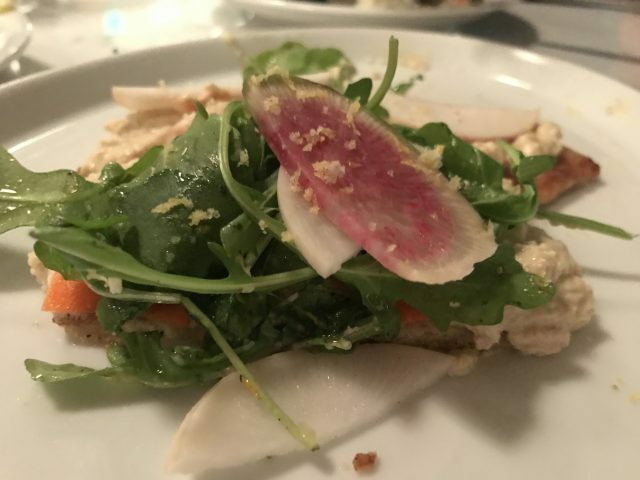 My first course was a beet dish. Now, I’m going to put this right out there…I don’t like beets, never have. But this dish surprised me. Made with arugula, pistachios, champagne vinaigrette and fried capers this is a beet dish I could eat every day! 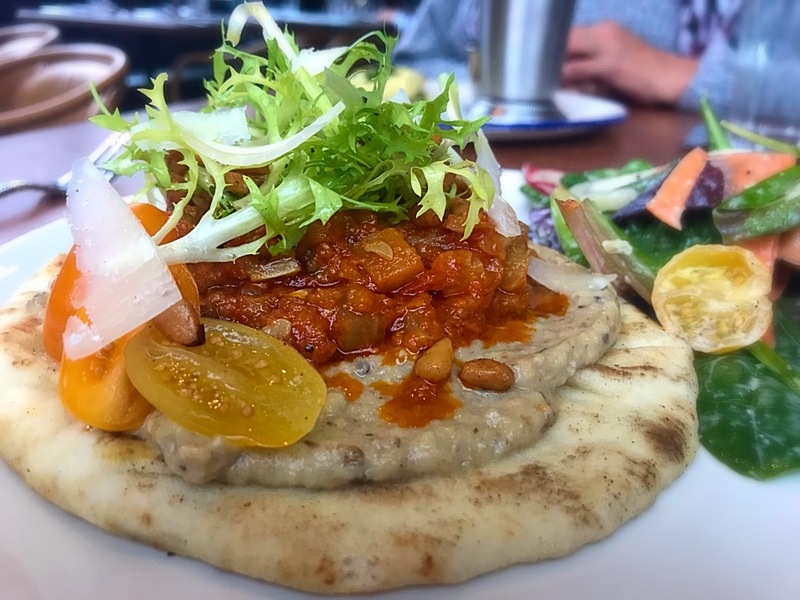 Next came a wonderful smoked eggplant with tahini and paprika. It’s unique and delicious flavors where wonderful and went very well with my wine selection. I was told that I should try the butternut squash soup so I did. I was not disappointed. It was, hands down, the best I’ve ever had. There was a bit of a bite to it, which was perfect. The rich, smooth texture was perfect for the unexpectedly cold evening that crept in. 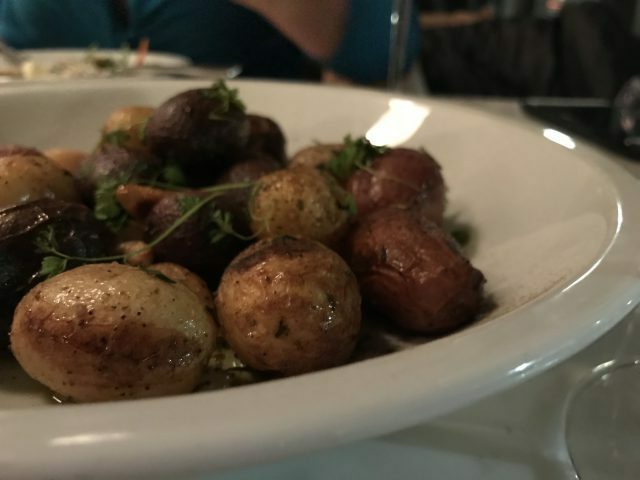 My sweet server brought over a dish of red potatoes sautéed with garlic, herbs and olive oil. They were perfect and yummy! I always save a little space in my stomach for dessert and I was not sorry I did. I indulged in a warm, Atlantic Savannah version of bread pudding. It was perfectly made with just the right amount of everything. I was also able to try a wonderful chocolate mousse with fresh nuts. The mousse was smooth and perfectly made. It was a wonderful end to a wonderful culinary experience. I believe that, along with fantastic food, a restaurant must have the perfect atmosphere, staff, and passion to ensure success. The Atlantic Savannah exquisitely demonstrates every element of success with pride and clear love for the people who visit the restaurant. I can’t recommend having a meal here enough. As a matter of fact, if you go to Savannah and don’t visit the Atlantic, you’ll be missing out on one of the best parts of Georgia. 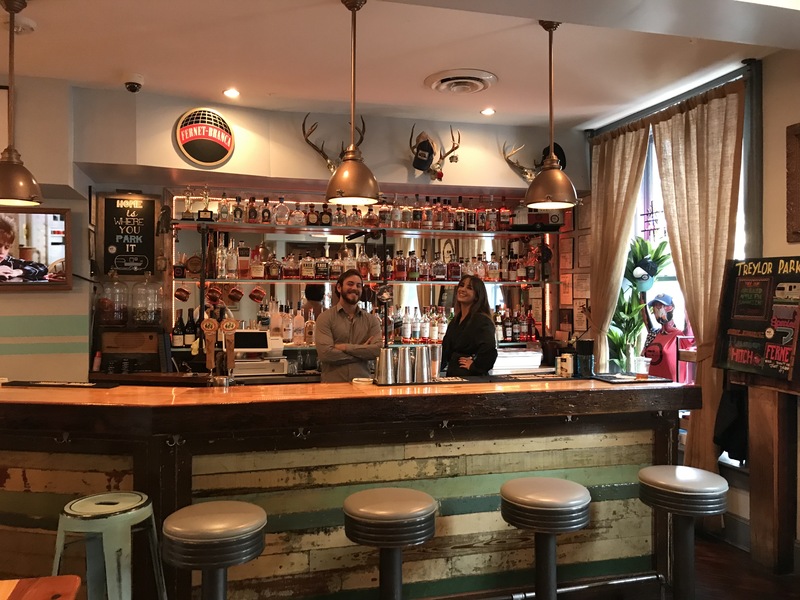 Located in the heart of the historic district, Treylor Park is an upscale cocktail bar that also serves as a restaurant. It’s a unique eatery attracting foodies and adding to foodie wonderland appeal. With a comfy beer garden outside and in the back of the property, beer lovers can enjoy great company, good beer, and a warm environment. I visited during lunch and immediately noticed the lively atmosphere. I was seated at the back so I could have a vantage point to see the whole restaurant. 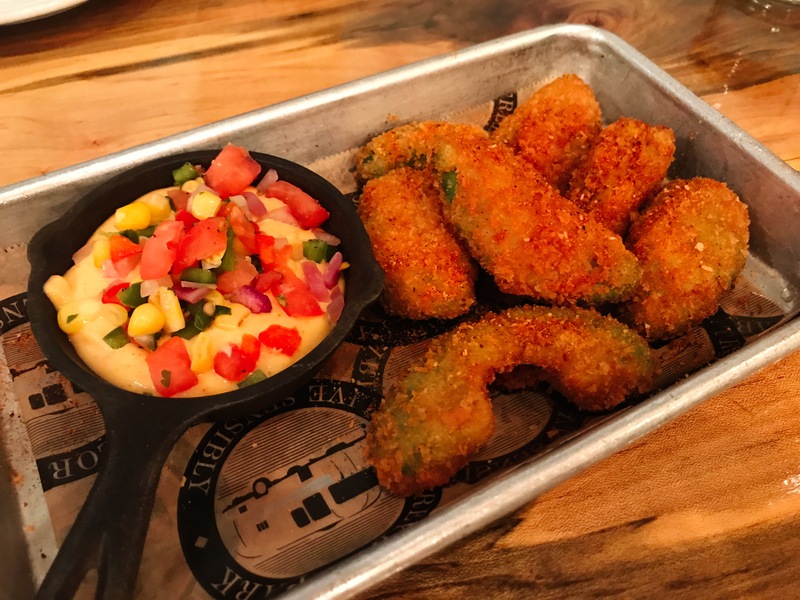 I started with, what I was told was a house favorite, fried Avocado fries made with a Panko crust and served with Sriracha aioli. They were delicious. Next came an Ahi Tuna, constructed with seared yellow fin tuna, soy ginger pizza sauce, sliced avocado, wasabi creme craiche, topped with Mozzarella and diced pickled vegetables. This was unique and so very delicious. It was a perfect portion for lunch. I’m always on the lookout for a good vegetarian dish, not because I am one but because my frequent partner in crime, Linda Beach, is. 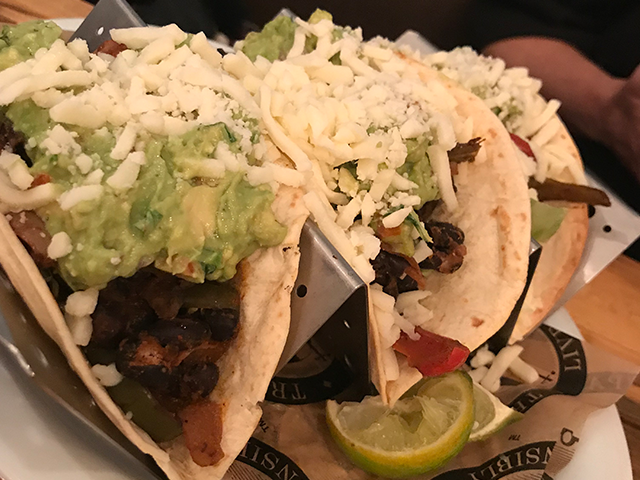 The Veggie Tacos Black with beans, fajita veggies, guacamole, and queso fresco fit the bill perfectly. They were wonderful and the amount just perfect. To finish the meal we both decided to try the Bourbon Pecan Pie topped with vanilla ice cream and ginger caramel…gooey goodness for sure. We also indulged in the Banana pudding crème Brulee that is Treylor Park’s spin on the classic dessert. Treylor Park is a fantastic, casual place to go for lunch or dinner, to grab a beer and socialize, or to go to enjoy the unique atmosphere and interesting decorations. My last food stop was at the Emporium and Kitchen Wine Market. Another restaurant that prides itself with locally sourced ingredients, the restaurant has a beautiful open design. The staff is warm and welcoming and I immediately felt like I was dining at a friend’s home. The extensive wine selection is impressive. I’m a wine lover, as I mentioned, and the options are wide and varied. 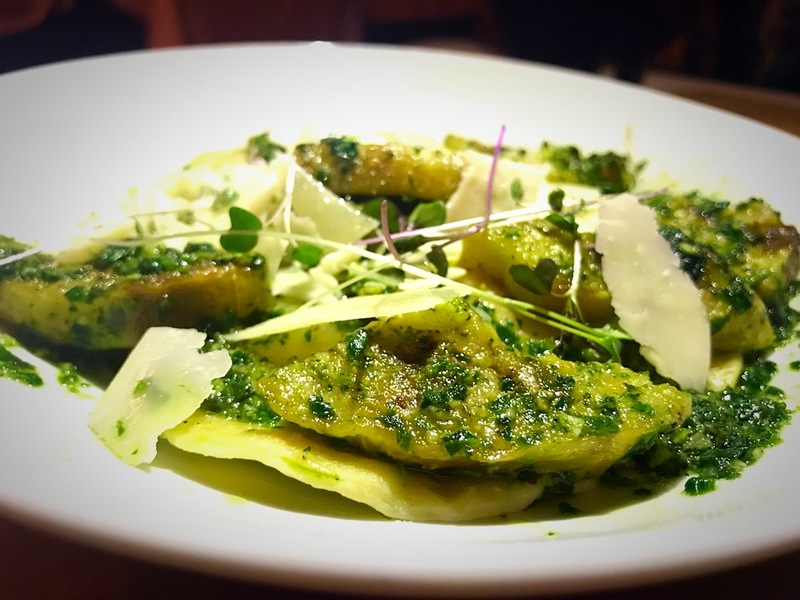 The dining selections are vast and, along with my server, I took my time going over them. First up was a delicious combination of cheese boards. 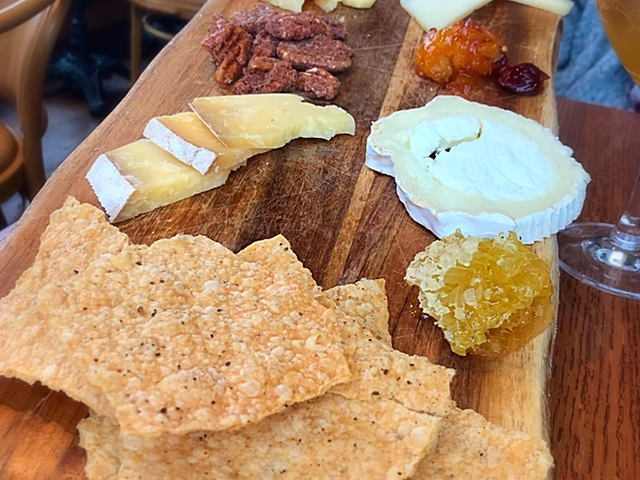 I indulged in a merged version of the Chef’s Board selection of domestic and imported cheese and seasonal accouterments and the Cheese Board chef’s selection, made with seasonal compote, fresh fruit, candied nuts, and crackers. 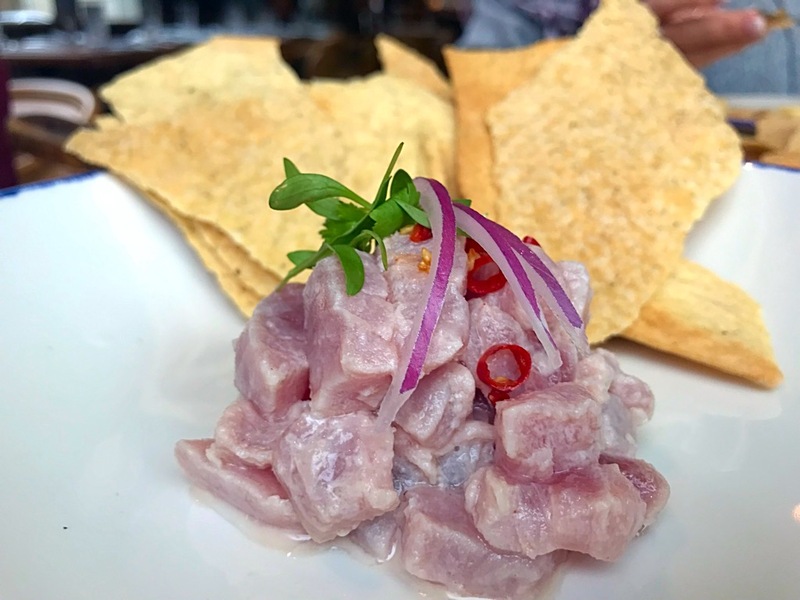 Next up was an amazing Ceviche with simple, fresh ingredients allowing for the natural flavors to come through. A mouthwatering shrimp appetizer made with fresh veggies and herbs followed that up. 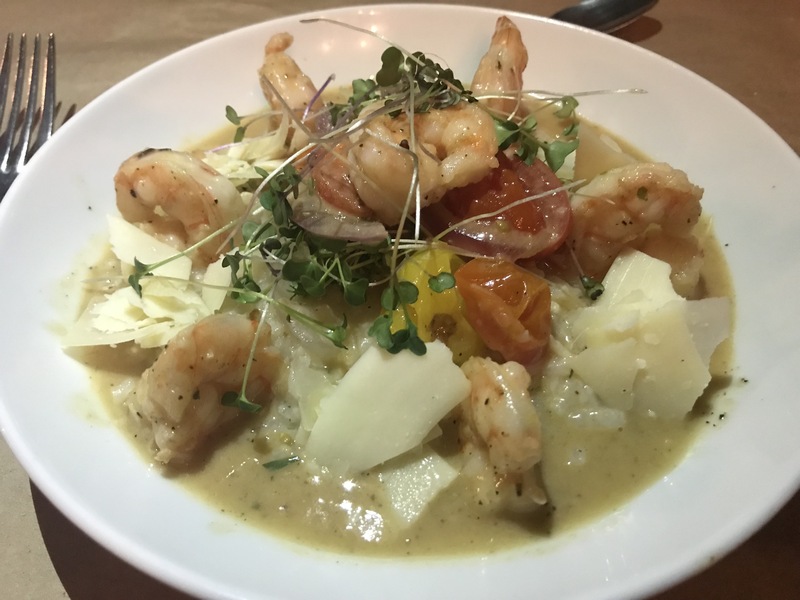 The flavors burst in my mouth and it was one of my favorite shrimp dishes from Savannah. The goodness kept coming with the next presentation of a round flatbread with arugula, balsamic, preserved tomato, Parmesan, and lemon caper sauce. It was unique and amazing definitely a house favorite. Bringing up a sweet end was the two unbelievably delicious desserts. I was in heaven with these two. I tried the Crème Caramel with honey lemon tuile and fresh fruit. 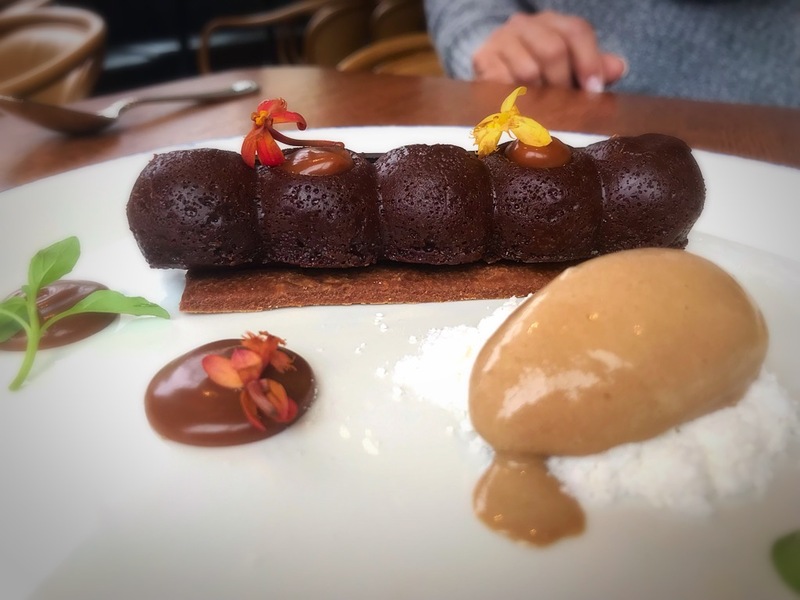 The frozen Espresso Soufflé with warm crullers. I was in culinary heaven by the time I floated out of The Emporium and Kitchen Wine Market. This is another restaurant that shouldn’t be missed while in Savannah. To do so would be to miss out on an experience you won’t have anywhere else. From the staff to the geniuses in the kitchen, to the atmosphere, The Emporium and Kitchen Wine Market is nothing short of extraordinary. As you can see, I pretty much ate my way through Savannah. 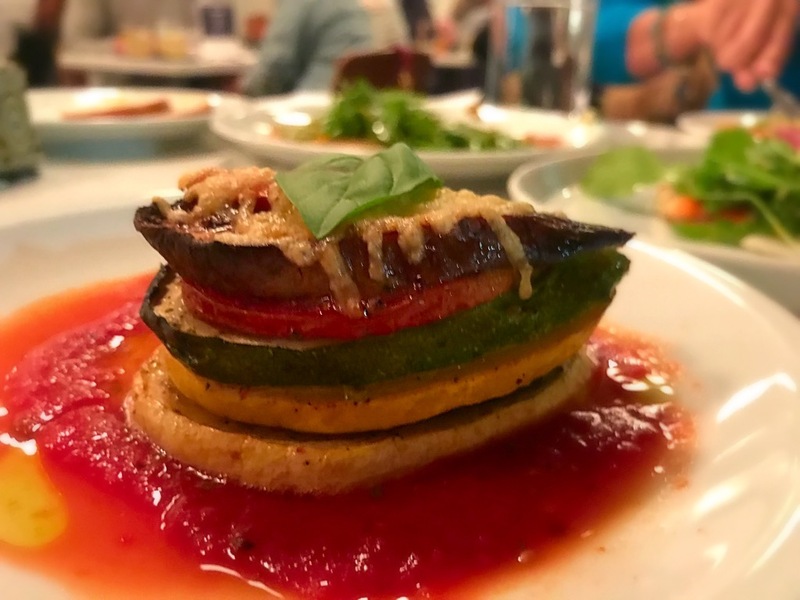 My experience was unparalleled and I can’t express my gratitude to Visit Savannah enough for hosting me and recommending these fantastic eateries. Have you ever eaten at any of these restaurants? Have you visited Savannah, Georgia? Tell me your experiences in the comments below.